Eyes and lips are my favorite part of makeup. I have way too much of it and I love it. Throughout the years, I’ve used all kinds of shadows, liners, mascaras, glitter, matte, normal colors, and crazy ones. So I know a little somethin’ somethin’ when it comes to eyes. Last month, I went a little crazy listing my favorite skin care, so I tried to keep this short(er) and sweet. While my collection rotates, somethings stay the same. 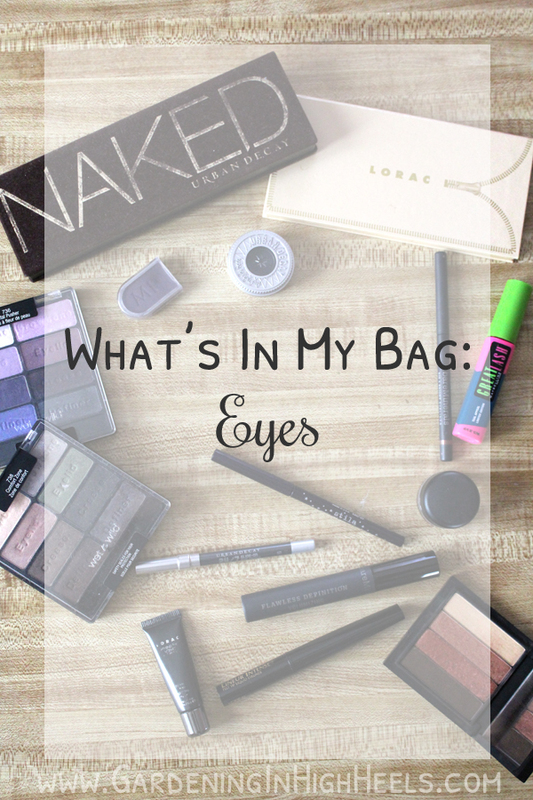 Here are the essentials in my makeup bag when it comes to eyes. I have oily skin which means oily eye lids. 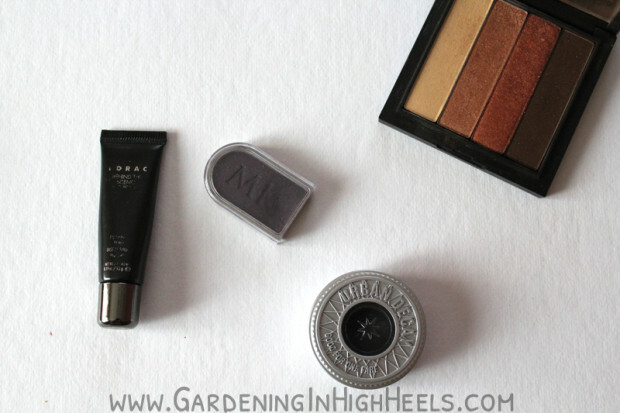 I have tried all kinds of primers and I love Lorac Behind the Scenes Eye Primer and Urban Decay primers. Usually I still get a little break down by the end of the day because I haven’t found the EXACT right product that’s bullet proof on oil slick eyes like mine, but these are pretty close. I have been using gel liner for a while. It was one of my first makeup breakthroughs. I love MAC in Dipdown. It’s a perfect brown that’s great for day and can be darkened up for night. But if I want a dark eyeliner, I reach for L’Oreal Lineur Intense Carbon Black. It lasts for ages and the wear on it is fantastic. The tip is flexible and creates a super thin line. It’s perfect for a cat (or kitten) eye. 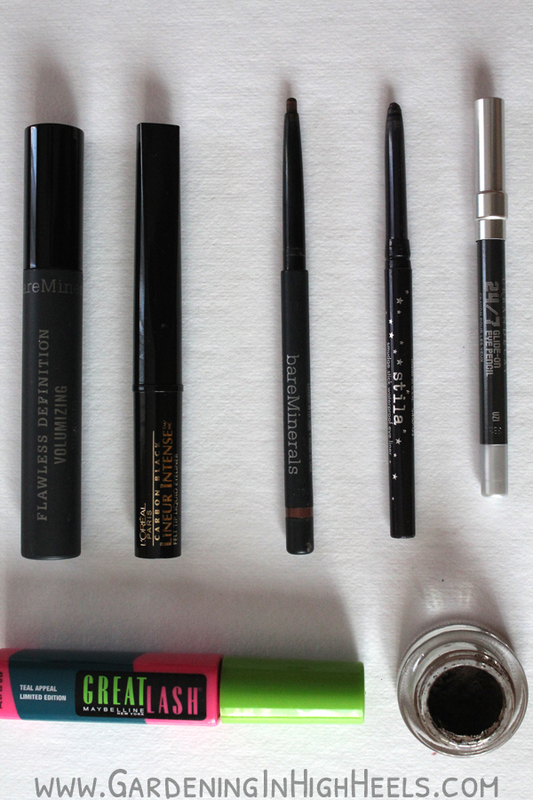 If I want something a little more smudged out, I reach for a pencil liner. 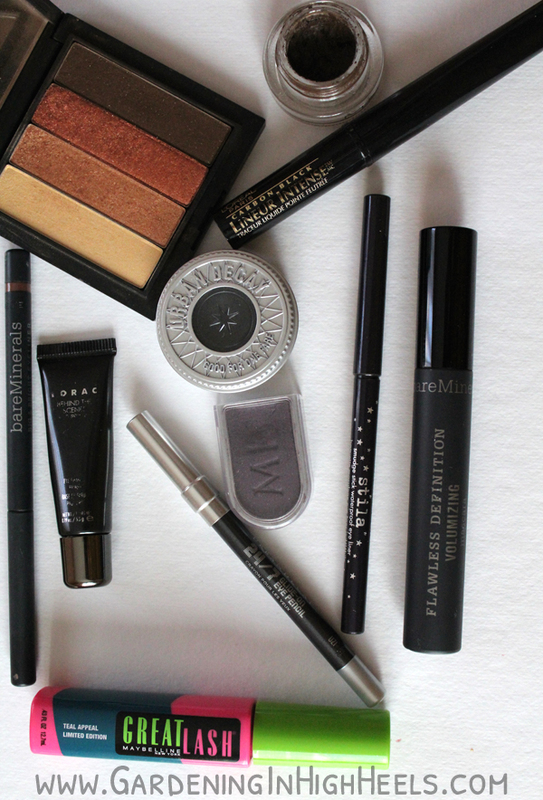 I love Bare Minerals, Urban Decay 24/7, and Stila Smudge Sticks. These all smoke out nicely and last for a while. I’m not picky with mascara. I love Tarte Lights, Camera, Lashes. Bare Minerals Flawless Definition, or good old fashioned Maybelline. Covergirl also makes great mascara. I love the Lashblast line. I do like the Maybelline colored mascara to use on my lower lashes instead of liner. I play favorites with my eye shadows. I’ll get stuck using one palette. I’ve been using Urban Decay Naked 3 a lot recently, but if I had to choose, I would give that up and keep the original Urban Decay Naked palette. I love Lorac eye shadows, too. They’re so silky and insanely pigmented. I was looking at the Unzipped gold palette, but I love the original Unzipped palette. Oh man Wet n Wild is seriously underrated. I love their eye shadow and it’s super cheap. $5 for an 8-pan palette? Holla. So that’s what’s in my makeup bag. These are things that I love and use on a regular basis. The waterproof version of that BareMinerals mascara is AMAZING — it doesn’t run or smudge AT ALL, through playing roller derby or running races in the rain. Highly recommend! I haven’t tried the waterproof version – hell, I didn’t know there was a waterproof version! I’ll definitely be on the lookout for it when I’m at Ulta/Sephora next. Thanks! We love so much of the same things! Love those Wet N Wild Color Icon palettes… And of course UD Nakeds. <3 Those WnW palettes are a steal! I can't believe it! The stila liquid liner pen is my holy grail – it lasts forever on the eyes but has never dried up on me before it was out of product! I’m a big fan of the UD naked palette. For cooler colours I love Inglot and Mac! I always think about trying it when I see a Stila sale but I never do. I hear so many good things about it, though. I love MAC, I haven’t seen Inglot in my area, but your pictures always make me want to order some! I have that same Wet n Wild palette with the purples and almost wear it on the daily. Works great for me and can’t argue with the price tag! Isn’t it fantastic! I love purples, pinks, and golds for green eyes and this covers the purple/pink selection so well! And yeah, $5? Done! I’m only recently venturing further into the makeup world and LOVE my two Naked pallets. I never need to buy eye shadow again. But yet… that Lorac one looks amazing. 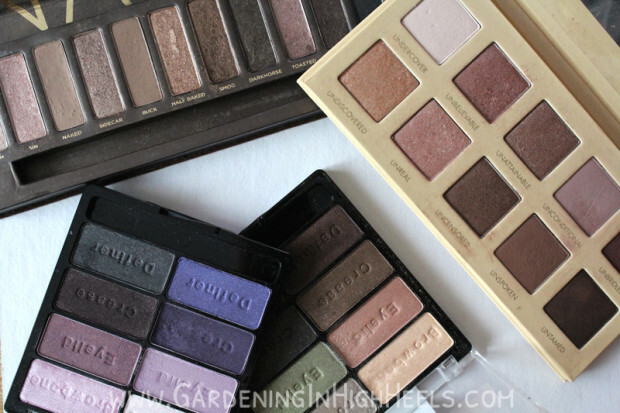 Which two Naked palettes do you have? I love mine. I swore I’d stop buying them after the first one buuuut oops! I love Lorac Unzipped. I almost didn’t buy it because of the Naked3, but the colors are different despite being in the same color family. The shadow is also fantastic quality.